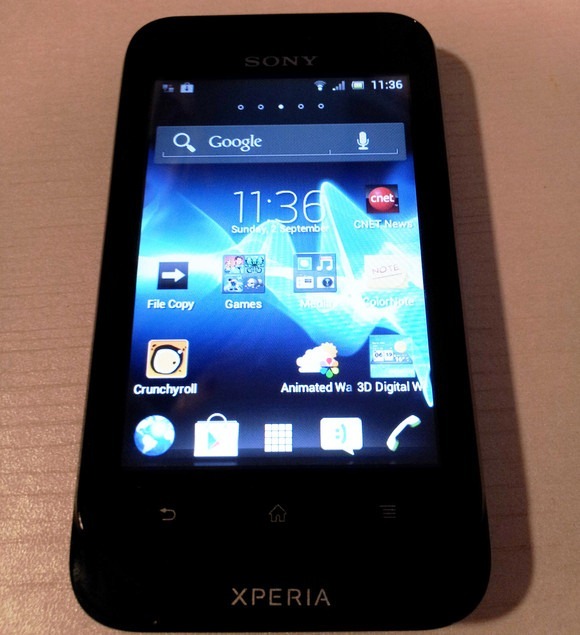 Here is the review of the Sony Xperia tipo. Sony announced it in June and we unboxed the device last week. It packs in a 3.2-inch (480 x 320 pixels) 262k colour TFT display and is powered by a 800 MHz Qualcomm Snapdragon processor. 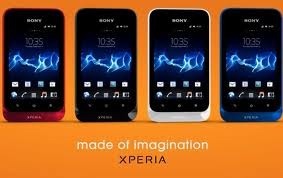 It is slightly larger than the Xperia mini and Sony has replaced the hardware buttons with the capacitive touch buttons. 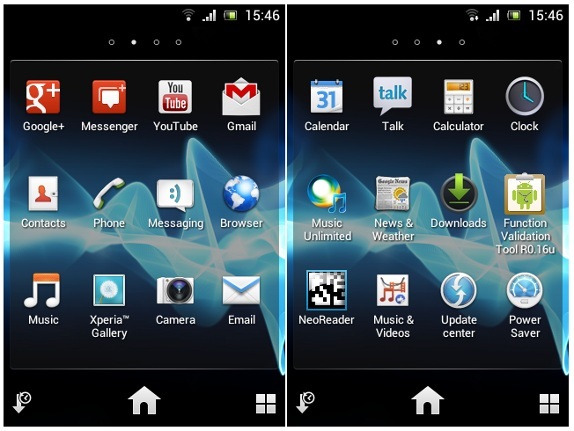 The Xperia tipo runs on Android 4.0 (Ice Cream Sandwich) with Sony’s own UI on top. The display is bright but the colours are not vibrant and has bad viewing angles since the colour depth is just 256k. You can see a large earpiece with a Sony branding below that. There is a proximity and LED indicator at the top right, which lights up when there is a notification, or when the phone is charging. But the phone lacks ambient light sensor. 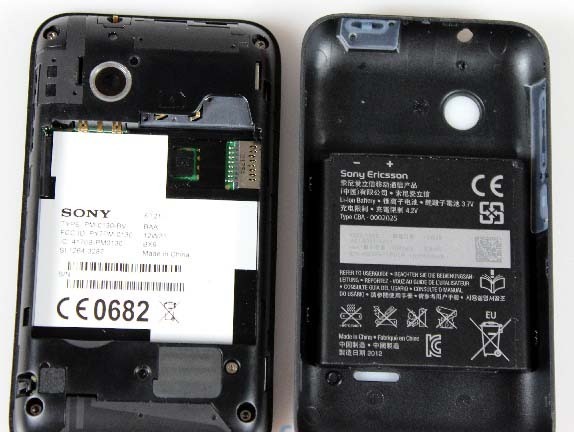 Sony has replaced the hardware buttons from the 2011 Xperia devices with the capacitive touch buttons. Below the display there are capacitive touch buttons for back, home and menu. 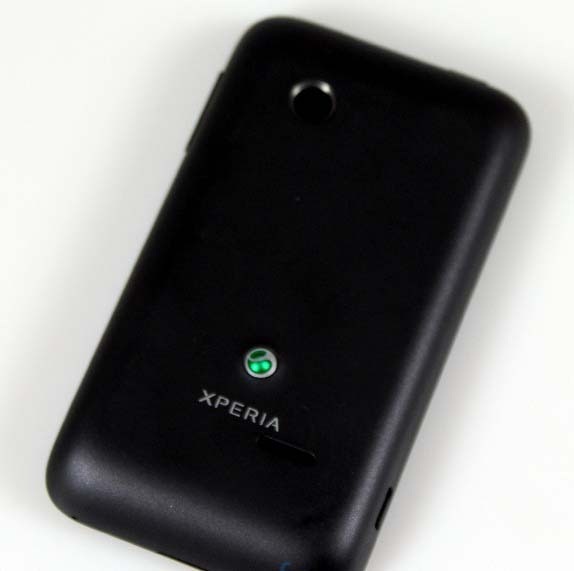 The bottom part is curved and has a Xperia branding. The volume rocker is present at the left side of the phone. There is a small hole for the lanyard at the bottom. The micro USB slot is at the right side of the phone. At the top there is a power / lock button and 3.5mm audio jack. At the back there is a 3.2MP fixed-focus camera without flash. There is a Xperia logo at the bottom along with a loudspeaker grill next to it. When you open the plastic back cover, you can see the 1500 mAh battery. You have to slide in the SIM card at the top in sideways. 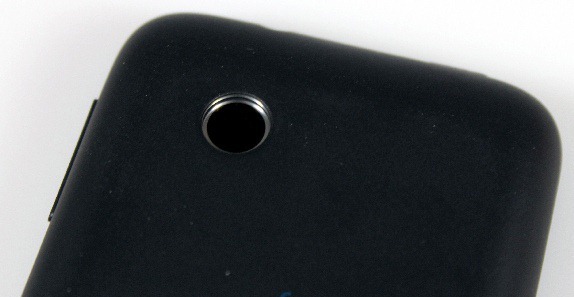 The micro SD card slot is below the SIM card slot. 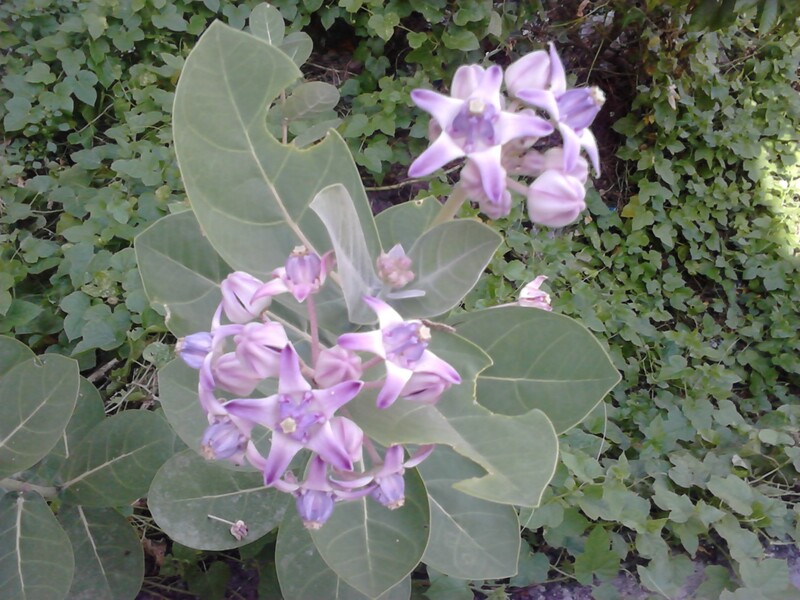 The 3.2 Megapixel fixed focus camera is not impressive but takes some decent shots. There is no auto focus, there is a touch to capture feature, so that you can touch the screen to capture an image instead of clicking on-screen camera button. 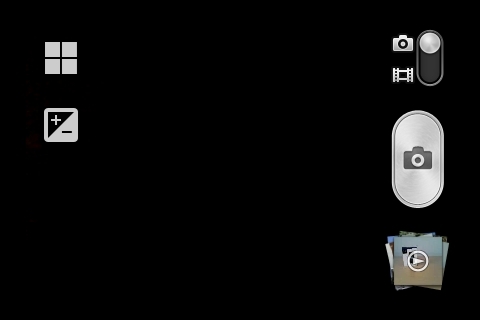 You can also launch the camera app quickly by swiping to left from the lock screen. 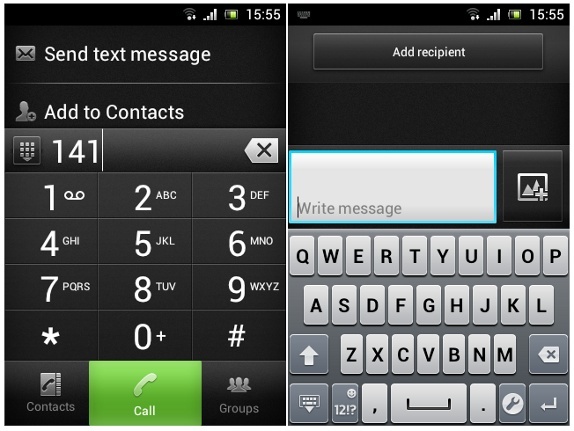 These features are useful since the phone doesn’t have a physical camera button. There are different scene modes (Night scene, Beach and snow and Sports) and you can also adjust the exposure. Other camera options include, Self-timer, White Balance settings, Metering, Geotagging and option to turn off shutter sound. You can shoot videos at VGA (640 x 480 pixels) resolution. You can also reduce the video resolution to QVGA or MMS format. 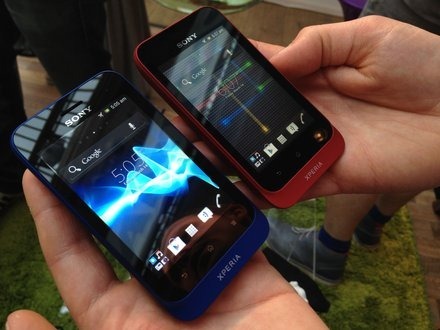 The Android 4.0 (Ice Cream Sandwich) is similar to the other Sony Xperia devices. There is a folder in the bottom tray for Media that lets you quickly access the Gallery, Music, FM Radio and Camera. You can remove and icon or drag any icon to the bottom items bar to create a folder. 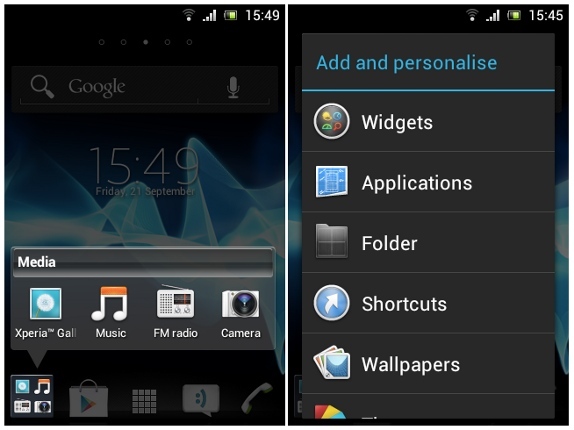 You can press and hold to personalise the home screen by adding apps, widgets, shortcuts or to change wallpapers and themes. The drop-down notification bar shows notifications, which you can swipe to clear. 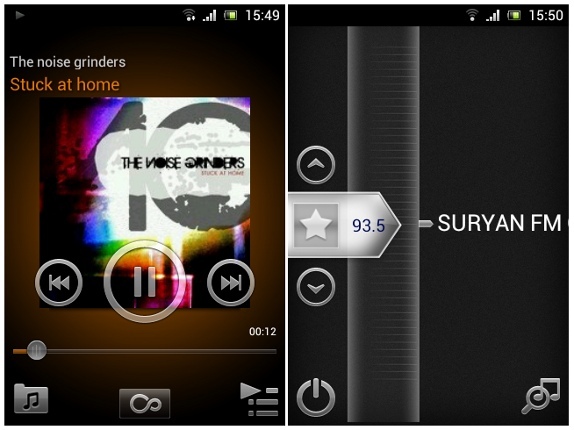 You can also control the music player from it. There are a range of utility apps such as Calendar, Calculator, Clock and News and Weather. There are the usual Google Apps such as Gmail, Play Store, Maps, Talk, YouTube and Google Search. There is an Office Suit app to view documents and a separate email app. The Music Player can play MP3, MP4, AAC,WAV, OTA, OGG and AMR audio formats. The music player lets you search music, view music by artist, albums and songs and create playlists. The loudspeaker is pretty loud. The Radio has RDS and auto tune function. You can mark the stations as favorites and jump between them easily. There is a track id feature that provides the name of the song that is playing by matching it to the online database. This is pretty useful to identify the songs played in the Radio. It can play videos at 3GP and MP4 formats. The calls went fine without any dropped calls. 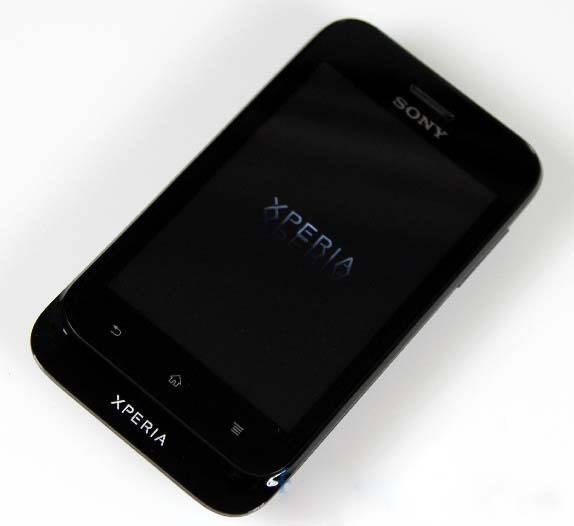 The SAR value in this phone is high at 1.62 Watts per kilogram, similar to the Xperia U. So it is recommended to use earphones if you are on a call for long time. The Messaging has simple UI. The keyboard is decent, but it is not comfortable for people with small fingers. 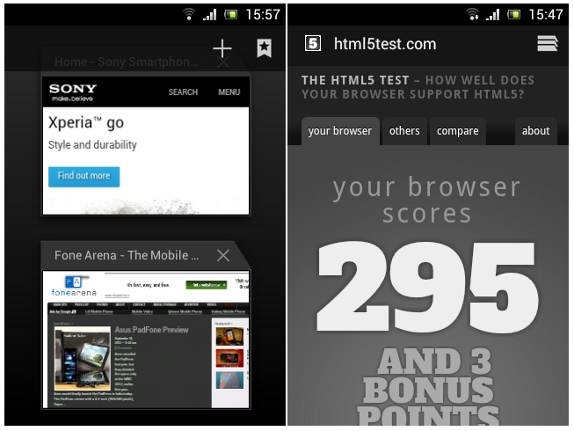 The Android webkit browser is fast. Since it has 2 finger multi-touch, you can pinch to zoom into the pages easily. 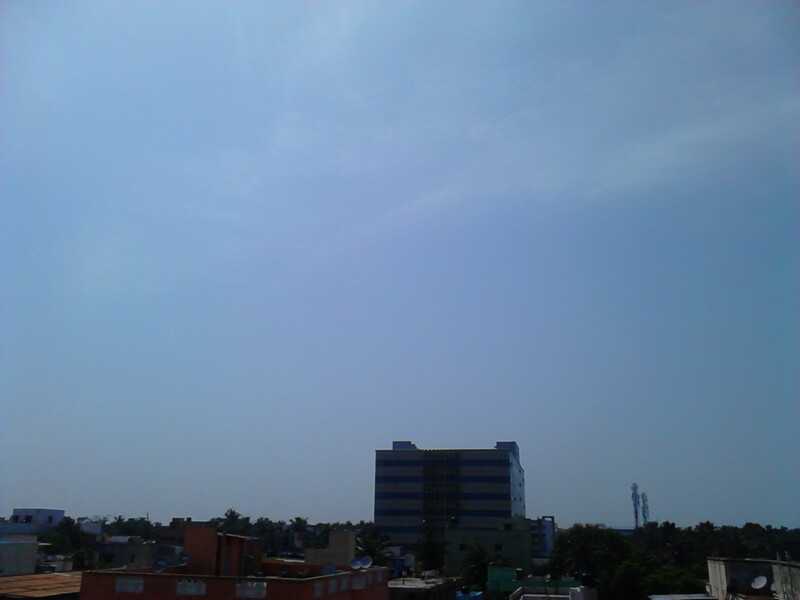 It scored 295 points in the HTML5 test with 3 bonus points. The browser also supports Adobe flash. 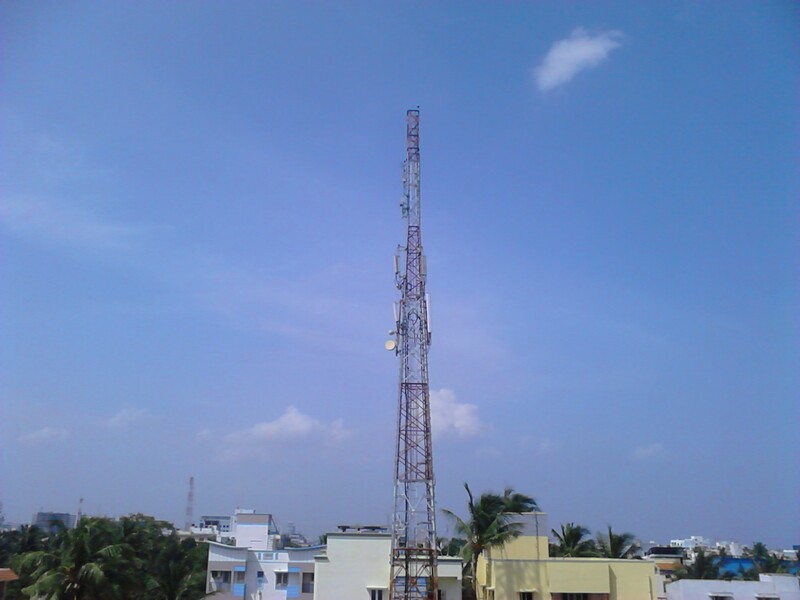 The connectivity options include 3G (HSDPA 7.2 Mbps ; HSUPA 5.76 Mbps), WiFi 802.11 b/g/n, Bluetooth with A2DP and GPS. 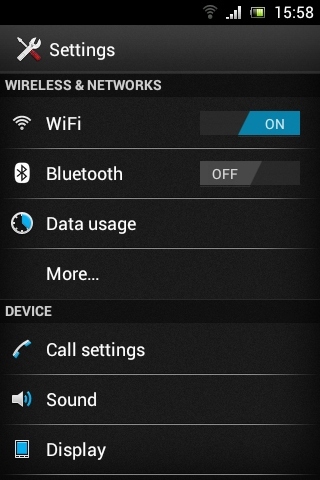 You can quickly toggle WiFi and Bluetooth on or off quickly. The data usage meter that comes with Android 4.0 lets you check the the data usage. In the advanced settings you can set the preferred networks, tethering options or WiFi hotspot. 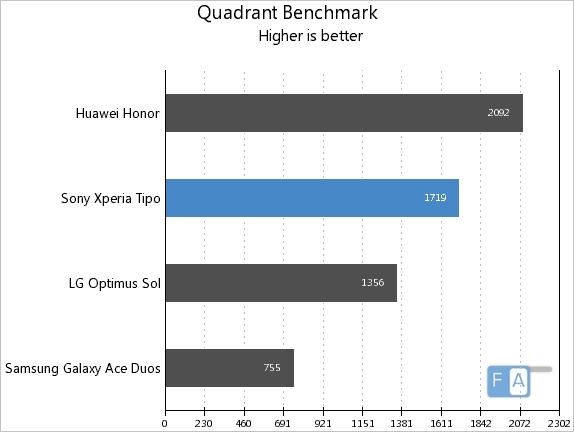 Here are some benchmarks to test the 800MHz Qualcomm Snapdragon S1 MSM7225A processor. 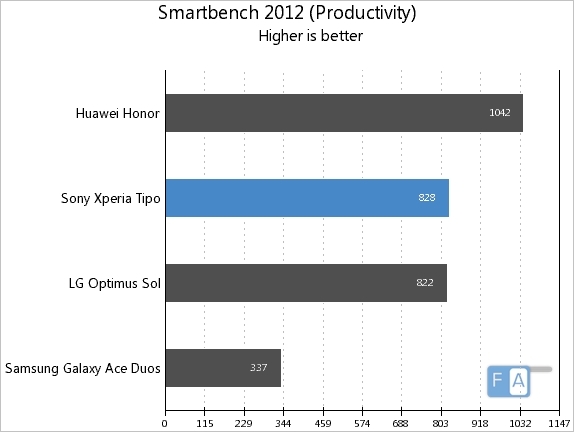 The 1GHz Honor leads but the Tipo overtakes Sol to reach the 2nd spot. 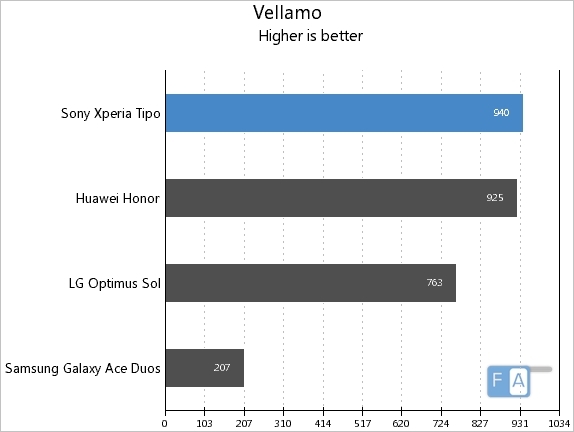 The Xperia tipo with Android ICS browser leads the Vellamo browser benchmark. 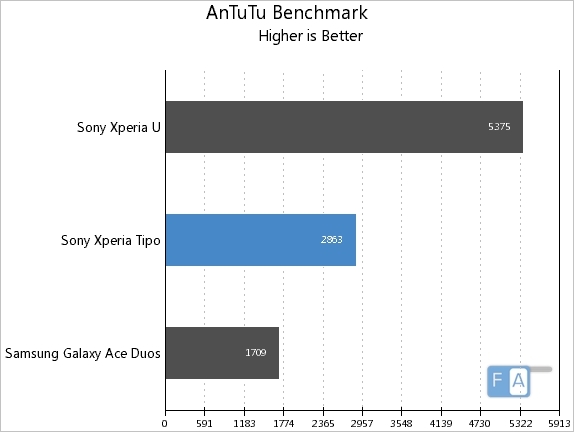 The Xperia U with the dual-core processor leads, but the tipo scores a decent score of 2863 in the AnTuTu benchmark. It overtakes the Sol in just a few points to reach the 2nd spot. 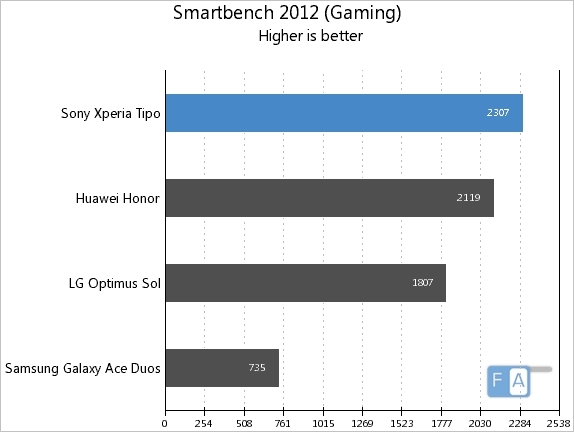 The Xperia tipo tops the Smartbench gaming benchmark. As an entry-level Android smartphone, the Sony Xperia tipo has better specs including 512MB of RAM, 2.5GB of user memory and performs better than most of the phones in the range such has HTC Explorer, LG Optimus L3 and Samsung Galaxy Y. The battery life is also good that lasts for a day with average use including few calls, messages and few hours of audio playback. It has a good build quality and comes with Android 4.0 out of the box, but the low resolution display and the fixed focus camera makes you think twice before opting for the device. But then, if you don’t care about lack of auto focus camera, low-resolution display and need a compact device, at a price of Rs. 9,500 this is a pretty good choice. Hope Sony reduces the price of the device in India soon to heat up the competition.